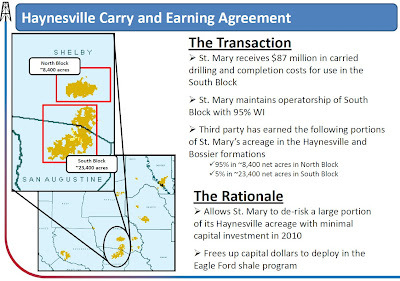 St. Mary Land & Exploration yesterday announced a "carry and earning agreement" with an unnamed third party that will change the company's approach to drilling its acreage in the Haynesville Shale. The deal provides that the new partner will provide $87 million of St. Mary's drilling expenses in its operated wells. In exchange, the partner can earn 95% of St. Mary's interests in 8,400 acres in northern Shelby County (the "North Block") and 5% of St. Mary's interests in its 32,400 acres in southern Shelby and northern San Augustine Counties (the "South Block"). The $87 million will go towards the drilling of the St. Mary's operated wells in the South Block. As I read it, the deal accomplishes two things. First, it narrows St. Mary's exposure in the Haynesville Play to the Shelby/San Augustine Co. border, which has turned into a hot prospect of late. Second, it allows St. Mary to divert +/-$80 million of capital expenditures to its prospects in the Eagle Ford Shale. 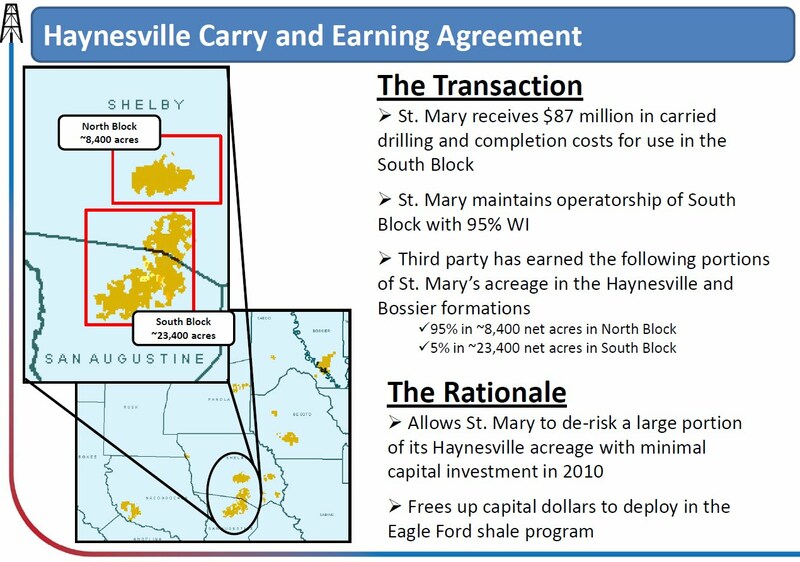 St. Mary was never a big player in the Haynesville Shale, so the deal makes sense. The company has other acreage in the play, but this Texas acreage is its focus. Oh yeah, and it looks like the company is going to change its name to SM Energy.